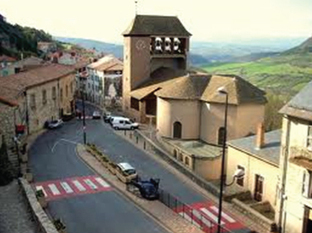 Roquefort village is located in the Parc Naturel des Grands Causses at an elevation of 630m, with about 700 inhabitants. The village stretches the side of the famous rock of Combalou South Larzac. Roquefort is also an industrial village with approximately 1000 people involved in the refining of the famous Roquefort cheese. This is a tradition dating back over 1000 years which is jealously guarded in the depths of its natural caves which are decorated by the landslide of Combalou, 2 km long and 300m wide. Roquefort sometimes spelled Rochefort in English, is a sheep milk blue cheese from the south of France, and together with Bleu d'Auvergne, Stilton and orgonzola is one of the world's best-known blue cheeses. Though similar cheeses are produced elsewhere, European law dictates that only those cheeses aged in the natural Combalou caves of Roquefort-sur-Soulzon may bear the name Roquefort, as it is a recognised geographical indication, or has a protected designation of origin. The cheese is white, tangy, crumbly and slightly moist, with distinctive veins of green mold. It has characteristic odor and flavor with a notable taste of butyric acid; the green veins provide a sharp tang. The overall flavor sensation begins slightly mild, then waxes sweet, then smoky, and fades to a salty finish. It has no rind; the exterior is edible and slightly salty. A typical wheel of Roquefort weighs between 2.5 and 3 kilograms, and is about 10 cm thick. Each kilogram of finished cheese requires about 4.5 litres of milk. Legend has it that the cheese was discovered when a youth, eating his lunch of bread and ewes' milk cheese, saw a beautiful girl in the distance. Abandoning his meal in a nearby cave, he ran to meet her. When he returned a few months later, the mold (Penicillium roqueforti) had transformed his plain cheese into Roquefort. Roquefort, or similar style cheese, is mentioned in literature as far back as AD 79, when Pliny the Elder remarked upon its rich flavor. In 1411 Charles VI granted a monopoly for the ripening of the cheese to the people of Roquefort-sur-Soulzon as they had been doing for centuries. Cheesemaking colanders have been discovered amongst the region's prehistoric relics. In 1925, the cheese was the recipient of France's first Appellation d'Origine Contrôlée when regulations controlling its production and naming were first defined. In 1961, in a landmark ruling that removed imitation, the Tribunal de Grande Instance at Millau decreed that although the method for the manufacture of the cheese could be followed across the south of France, only those whose ripening occurred in the natural caves of Mont Combalou in Roquefort-sur-Soulzon were permitted to bear the name Roquefort. The mold that gives Roquefort its distinctive character Penicillium roqueforti) is found in the soil of the local caves. Traditionally the cheesemakers extracted it by leaving bread in the caves for six to eight weeks until it was consumed by the mold. The interior of the bread was then dried to produce a powder. In modern times the mold can be grown in a laboratory, which allows for greater consistency. The mold may either be added to the curd, or introduced as an aerosol, through holes poked in the rind. Roquefort is made entirely from the milk of the Lacaune, Manech and Basco-Béarnaise breeds of sheep. Prior to the AOC regulations of 1925, a small amount of cow’s or goat’s milk was sometimes added. A total of around 4.5 litres of milk is required to make one kilogram of Roquefort. The cheese is produced throughout the department of Aveyron and part of the nearby départements of Aude, Lozère, Gard, Hérault and Tarn. As of 2009, there were seven Roquefort producers. The largest by far is Roquefort Société made by the Société des Caves de Roquefort (a subsidiary of Lactalis), which holds several caves and opens its facilities to tourists, and accounts for around 60% of all production. Roquefort Papillon is also a well-known brand. The five other producers, each holding only one cave, are Carles, Gabriel Coulet, Fromageries occitanes, Vernières and Le Vieux Berger. Around three million cheeses were made in 2005 (18,830 tons) making it, after Comté, France's second most popular cheese. Production of Roquefort cheese entails "4,500 people who herd special ewes on 2,100 farms producing milk ... in a carefully defined oval grazing area across the Larzac Plain and up and down nearby hills and valleys." Total production in 2008 of about 19,000 tons was reported. 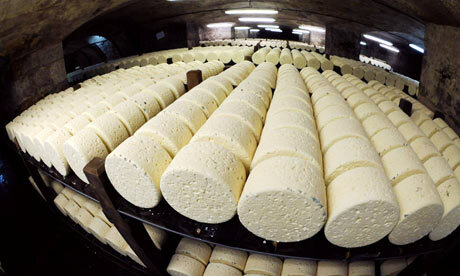 The proportion of Roquefort exported to the United States remained small, only 450 tons out of 3,700 in total exports. Spain, with purchases of 1,000 tons, was by far the largest foreign customer. In early 2009, Susan Schwab, outgoing US Trade Representative, announced a 300% tariff on the cheese, apparently the highest level by far of any in the package of tariffs placed on dozens of European luxury goods in response to a European ban on hormone treated US beef. The tariff was suspended several months later as the US and EU settled the dispute. Although Roquefort provides an excellent eating experience throughout the year, it is at its best between April and October, consumed after a five month ripening period. The cheese should be left in its original wrapper or in aluminium foil in order to keep it from drying out, either in a cool cellar or in the bottom section of a refrigerator. It should be returned to room temperature approximately one hour before serving, and should be protected from sudden temperature changes. Roquefort's strong flavour and creamy texture perfectly complement a simple salad when small quantities of the cheese are crumbled and sprinkled frugally on the lettuce. Its strongly salty taste is particularly appreciated where fine dining, smoking or simple effluxion of time have desensitized the palate. The regional cuisine in and around Aveyron includes many roquefort based recipes for main-course meat sauces, savory tarts and quiches, pies and fillings. Before Alexander Fleming discovered penicillin, it was common in country districts for shepherds to apply this cheese to wounds in order to avoid gangrene. All milk used must be delivered at least 20 days after lambing has taken place. 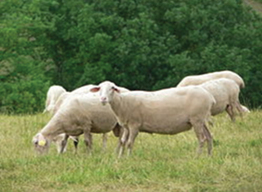 The sheep must be on pasture, whenever Possible, in an area including most of Aveyron and parts of neighboring départements. At least 3/4 of any grain or fodder fed must come from the area. The milk must be whole, Raw (not heated above 34 °C), and unfiltered except to remove macroscopic particles. The addition of rennet must occur within 48 hours of milking. 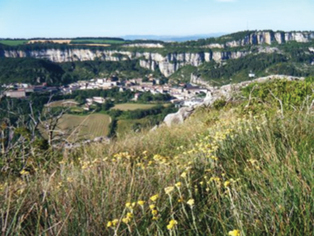 The Penicillium roqueforti used in the production must be produced in France from the natural caves of Roquefort-sur-Soulzon. The salting process must be performed using dry salt. The whole process of maturation, Cutting, packaging and refrigeration of the cheese must take place in the commune of Roquefort-sur-Soulzon. Roquefort has the highest level of glutamates of any naturally produced food, containing 1280 mg of glutamate per 100 g of cheese.